Taking as its point of departure the fundamental observation that games are both technical and symbolic, this collection investigates the multiple intersections between the study of computer games and the discipline of technical and professional writing. Divided into five parts, Computer Games and Technical Communication engages with questions related to workplace communities and gamic simulations; industry documentation; manuals, gameplay, and ethics; training, testing, and number crunching; and the work of games and gamifying work. In that computer games rely on a complex combination of written, verbal, visual, algorithmic, audio, and kinesthetic means to convey information, technical and professional writing scholars are uniquely poised to investigate the intersection between the technical and symbolic aspects of the computer game complex. The contributors to this volume bring to bear the analytic tools of the field to interpret the roles of communication, production, and consumption in this increasingly ubiquitous technical and symbolic medium. 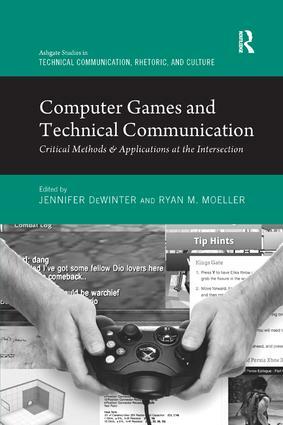 Jennifer deWinter is Assistant Professor of Rhetoric and associated faculty in the Interactive Media and Game Development program at Worcester Polytechnic Institute, USA, and Ryan M. Moeller is Associate Professor of English at Utah State University, USA. This series promotes innovative, interdisciplinary research in the theory and practice of technical communication, broadly conceived as including business, scientific, and health communication. Technical communication has an extensive impact on our world and our lives, yet the venues for long-format research in the field are few. This series serves as an outlet for scholars engaged with the theoretical, practical, rhetorical, and cultural implications of this burgeoning field. The editors welcome proposals for book-length studies and edited collections involving qualitative and quantitative research and theoretical inquiry into technical communication and associated fields and topics, including user-centered design; information design; intercultural communication; risk communication; new media; social media; visual communication and rhetoric; disability/accessibility issues; communication ethics; health communication; applied rhetoric; and the history and current practice of technical, business, and scientific communication. The series is proud to congratulate Ehren Pflugfelder on winning the 2018 CCCC Technical and Scientific Communication Award in the category of Best Book in Technical or Scientific Communication for the book Communicating Technology and Mobility: A Material Rhetoric for Persuasive Transportation!